The moon Enceladus is the second nearest of Saturn's large inner moons, after Mimas, lying 147,855 miles out from the planet. 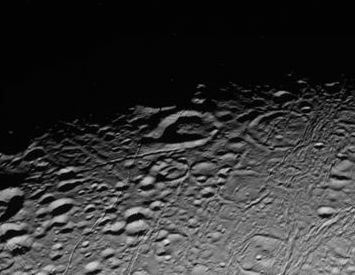 With a diameter of just over 313 miles, it is the sixth largest of Saturn's moons. One orbit around the planet takes 1.37 days. As you can see, the moon Enceladus seems to have two distinct types of surface terrain. In fact, there are five different sets of features to be found on its surface. 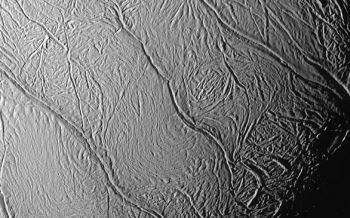 The majority of Enceladus's surface is pure ice, formed from water that has spewed out of its interior, in what is termed a "cryovolcano". This makes the moon highly reflective, so much so, it is the brightest object in the solar system. Let's now examine the various features found on that surface. As can be seen in the above image, Enceladus has large areas of impact craters. Because the surface is water ice, however, the craters become "degraded" over time and start to blend in with their surroundings. There are two areas of smooth plains on the moon Enceladus, named Sarandib Planitia and Diyar Planitia. They feature no impact craters, except very small ones and their smoothness indicates that the surface at these areas is extremely young, geologically speaking. At the moon's south polar region, there is a strange geological feature, consisting of four giant fractures in the surface, with tall ridges either side. The term "tiger stripes" is a nickname, but each of the four have been given official names: Alexandria Sulcus, Cairo Sulcus, Baghdad Sulcus and Damascus Sulcus. Each "stripe" is, on average, 80 miles long, 1.25 miles wide and 1640 feet deep. The fact that there are virtually no impact craters in this area suggest that is a very young region. It is, however, a centre of high cryovolcanic activity. 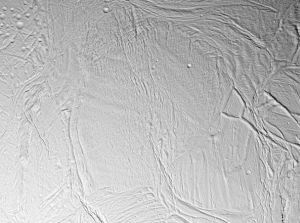 This heading includes such things as ridges, scarps and troughs, features all found on Enceladus. There are also huge canyons, which can be as much as 125 miles long, six miles wide and 3280 feet deep. As stated above, a "cryovolcano" is simply a geological feature where water is the erupted substance, rather than molten rock, ejected by "normal" volcanoes. Huge plumes of water have been detected by Cassini and the probe actually flew through one, enabling it to prove conclusively what the plume consisted of. It found mostly water vapour, with traces of nitrogen, methane and carbon dioxide. A later fly-by detected the presence of simple organic compounds, too, leading to the tantalising possibility of some form of life on the satellite. 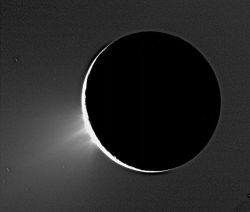 It is also thought that the cryovolcanic activity on the moon Enceladus is instrumental in the formation of Saturn's E Ring. 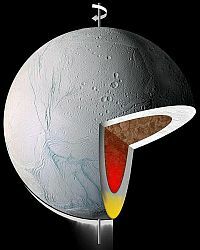 Most recent studies, based on Cassini fly-bys, suggest that Enceladus possesses a large silicate/iron core, over which there is a mantle comprised mostly of water-ice. On top of that is the icy crust. Over the millennia, radioactive and tidal heating will have raised the core temperature to around 1,000 degrees Kelvin. This is enough to melt the inner mantle. It appears that it's also enough to melt part of the core, producing pockets of magma. 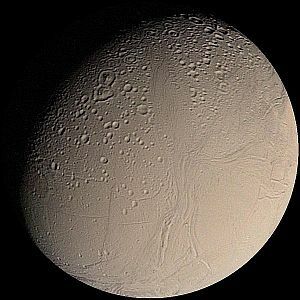 The fact that the plumes of water vapour being thrown out into space are "salty" - that is, containing sodium compounds, it is postulated that beneath the surface of Enceladus, there is an ocean of liquid water. This is possible because of the moon's internal heating, mentioned earlier. It further postulates the moon's possible role in harbouring alien life.